Summary: Maintaining genetic diversity is critical for the long-term survival and persistence of natural populations, yet the inclusion of population genetic analyses into conservation and management decisions is lacking for many taxa. Due to the widespread occurrence and negative consequences of the infectious benign tumor disease fibropapillomatosis (FP), sea turtles are a group that could benefit dramatically from more and better genetic studies relating disease dynamics to genetic diversity and candidate resistance genes. Consequences of FP can range from mortality to complete tumor regression, and the green turtle Chelonia mydas shows significantly higher FP prevalence than all other species. This project investigates the functional genetic factors potentially influencing FP susceptibility within and among species by sequencing genes of the Major Histocompatibility Complex (MHC) in green sea turtles (C. mydas) and the less FP-susceptible loggerhead turtle (Caretta caretta). 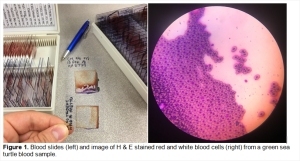 MHC genes code for immune surveillance molecules that identify pathogens and flag them for destruction. Because higher levels of MHC variation allow more pathogens to be recognized, MHC genes are the most diverse genes in the vertebrate genome, with multiple gene copies and often dozens of genetic variants in a single population. Due to this high variability and important role in immunity, MHC genes are ideal markers for measuring the genetic viability and health of populations, particularly in the context of disease. Understanding the underlying mechanisms driving disease prevalence within Florida’s sea turtle populations is a necessary first step in developing the management and conservation approaches needed to mitigate for disease, or to identify better treatment and prevention options. Results: Fibropapillomatosis (FP) is a tumor-forming disease that mainly affects juvenile green turtles (Chelonia mydas) in coastal habitats. Chelonid fibropapilloma-associated herpesvirus (CFPHV) is believed to be the viral component necessary for FP to develop. CFPHV can be found in FP tumors using real-time polymerase chain reaction (qPCR) techniques, but is not necessarily located elsewhere within the turtle. Localization of the virus to certain areas of the body is a common trait in herpesviruses; therefore it is not surprising to find CFPHV in tumors, but not in other locations. However, CFPHV is occasionally detected in the blood of turtles both with and without FP tumors. The state where the virus is in the bloodstream is known as viremia, and is not well understood in the turtle-FP disease system. The goal of this study was to better understand why certain blood samples exhibit viremia, while others do not. We analyzed juvenile green turtle data from a long-term dataset (1995-2017) in the Indian River Lagoon, Florida, USA. All turtles assessed in this study had blood samples tested for CFPHV using qPCR. This study was split into two analyses. The first was to consider how the status of FP tumors affects CFPHV viremia. CFPHV could potentially enter the bloodstream via tumors, and therefore viremia may be more likely in turtles more heavily afflicted with FP tumors, both in quantity and severity. Furthermore, CFPHV may be more likely to enter the bloodstream from tumors in specific locations, making turtles with tumors in these locations more likely to exhibit viremia. For over 300 turtles afflicted with FP, we used logistic regression models to assess the effects of the quantity, severity, and locations of tumors on CFPHV viremia. The second part of the study was to investigate viremia in recaptured individuals. Here we looked at individuals that tested positive for CFPHV in blood and were subsequently recaptured and tested again. From this we considered whether individuals maintained CFPHV viremia when recaptured, and whether the time between captures affected whether or not viremia remained. Additionally, we assessed how FP state affected CFPHV viremia in recaptures. This study gives us a better understanding of the role of viremia in FP development, including whether or not CFPHV remains in blood for an extended period of time, and whether viremia occurs during particular phases of FP. The results of this study will be informative for future research using blood samples for CFPHV detection, allowing better accuracy for measures such as CFPHV prevalence in populations.